Software-defined networking technologies like SD-WAN enable seamless connections between remote workers and separate branch locations. Cloud storage provides ubiquitous access to a variety of pooled resources and allows for the rapid provisioning of mission-critical applications within these distributed enterprise environments. As the modern business infrastructure continues to disperse and adopt these more streamlined models, the demand for reliable and dynamic wide area network (WAN) links has never been more important. This presents a difficult problem for businesses who are either evaluating or transitioning to these modern architectures. How can they objectively decide if these changes are really needed? Which system best suits their demands and budget? More importantly, how will their applications respond once these changes are made? IT managers and engineers tasked with answering these questions and overseeing the process are responsible for identifying bandwidth requirements and validating application performance with thorough testing. Since application performance can be highly sensitive to bandwidth and network impairments like latency and packet loss, ensuring the resiliency and dependability of these fluid systems depends on accurate testing before going live to predict, optimize, and troubleshoot the performance of applications over the WAN. Disruptive testing on the production network is should never be allowed within most enterprises andtesting on a local network can result in application failure that adversely affects business operations. Because there’s no way to deterministically identify critical issues that could negatively influence end-user experience and account for the impact of the WAN on application performance, testing on a local test network alone is insufficient. Developing a test network may help account for WAN conditions, but this could involve shipping equipment around the world and coordinating configuration and protocols, all of which would consume a significant number of man-hours. Additionally, those conducting the tests can’t control the conditions found within the WAN and since they’re always changing, there’s no way to practically recreate certain impairments or performance issues that are encountered. This isn’t a practical solution when time and money are at stake, so what’s the best way to obtain deterministic and repeatable test results? What’s the most reliable way to eliminate unnecessary spending, save time, and ensure the success of a business network? A WAN emulator appliance is the most reliable and practical way to validate application performance by allowing users to quickly configure and deploy test networks within a lab setting. These test networks can mimic the exact conditions of a live production network found within the WAN. The emulator appliance can even simulate up to 15 separate WAN links per port with a range of bandwidth rates to model a full enterprise network of distributed branch offices, data centers, and end users. Applying impairments like packet loss, latency, and congestion to these links provides users an accurate and repeatable testing method to observe how WAN conditions can affect application performance. Is It A Network Issue Or A Bandwidth Issue? By throttling bandwidth speeds, users can determine exactly how much bandwidth is needed for an application to properly function and even avoid over purchasing bandwidth. Different components or appliances used within a network can also be isolated and tested to understand how they’re affecting network performance. This provides a reliable method of troubleshooting, identifying bottlenecks, and evaluating solutions from multiple vendors to guide purchasing decisions. 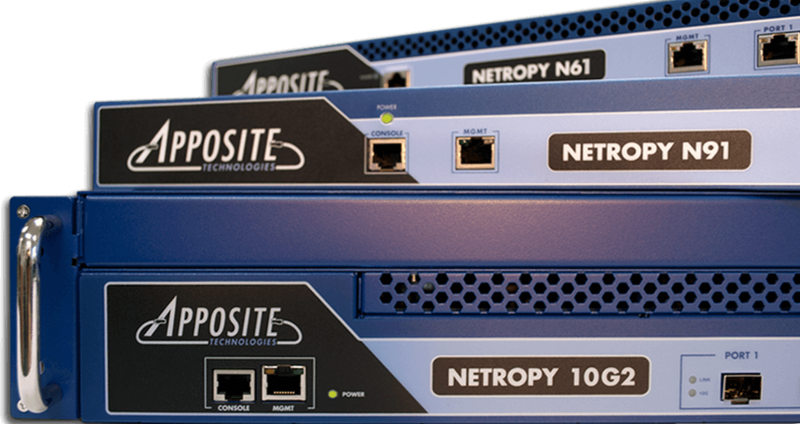 Apposite Technologies’ line of WAN emulators are purpose-built testing appliances specifically developed for testing scenarios where business success depends on a reliable network. This hardware uses highly accurate packet processing algorithms to offer the precision of high-end test tools in a cost-effective appliance. As a transparent Ethernet bridge, they are easy to install, and applications can be tested without the need for routers or any other WAN equipment. Simply place the appliance between a client and server, office PC and corporate LAN, or any two nodes used within your network, plug your controlling PC into the management port, and deploy test links within minutes. A simple and intuitive browser-based GUI allows users to quickly configure these test links and apply impairments. To learn more about how WAN emulation can help you make the most of your network, schedule a demo with one of Apposite Technologies’ product experts. For a more technical overview of WAN emulation, download the white paper or visit the Apposite Blog.